Premium cider paired with food is an adventure which more and more people want to experience. Pips Cider is a market leader in promoting the benefits of enjoying food with cider. 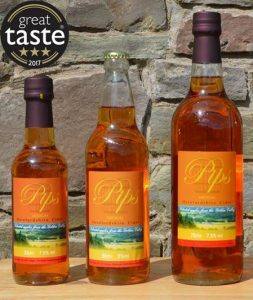 Pips Herefordshire Cider is a multi-award winning family owned craft cider producer based in the beautiful Golden Valley, in Herefordshire, England. Pips Herefordshire Cider is made from a subtle and unique blend of seven varieties of cider apples grown on our own farm. It contains 100% apple juice with no colourings or flavourings. Our blending process allows the different characteristics of each apple variety to complement each other. 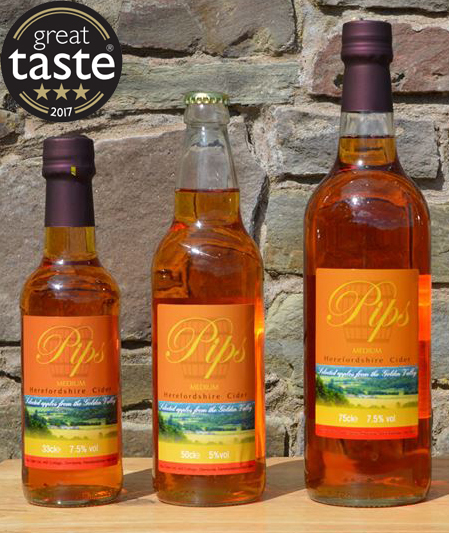 Pips Herefordshire Cider is a perfect alternative to wine with certain food dishes, and for special occasions why not share a bottle with a friend or relative? For weddings receptions and parties make your table dressing attractive, whilst giving your guests something different to begin the proceedings. We have a range of celebration ciders with personalised labelling for your special day. We are a multi award winning Herefordshire Cider Producer. We are Protected Geographical Indication (PGI) accredited which means our ciders can be described as Herefordshire Cider, a reserved term under EU regulations.· More details on our PGI page. Throughout the year we are present at various festivals, events, markets, and tastings. Look out for the announcements on Facebook and Twitter and come along to say hello and taste our ciders.